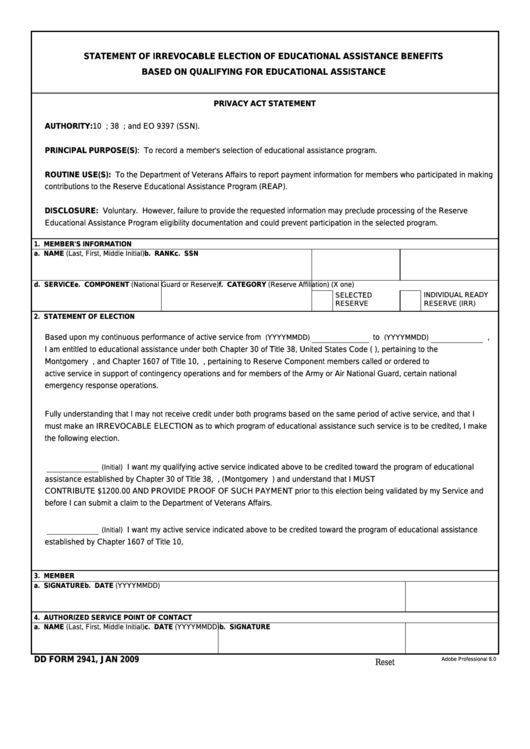 Download a blank fillable Dd Form 2941 - Statement Of Irrevocable Election Of Educational Assistance Benefits in PDF format just by clicking the "DOWNLOAD PDF" button. Complete Dd Form 2941 - Statement Of Irrevocable Election Of Educational Assistance Benefits with your personal data - all interactive fields are highlighted in places where you should type, access drop-down lists or select multiple-choice options. AUTHORITY: 10 U.S.C. Chapter 1607; 38 U.S.C. Chapter 30; and EO 9397 (SSN). PRINCIPAL PURPOSE(S): To record a member's selection of educational assistance program. contributions to the Reserve Educational Assistance Program (REAP). Educational Assistance Program eligibility documentation and could prevent participation in the selected program. before I can submit a claim to the Department of Veterans Affairs. established by Chapter 1607 of Title 10, U.S.C. I understand that there is no monetary contribution required on my part.